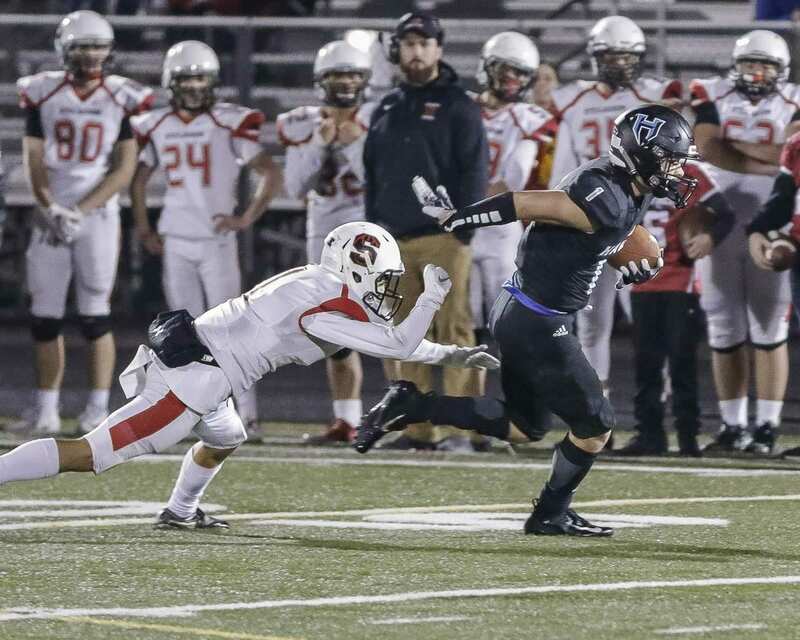 CAMAS — The Hockinson Hawks gave themselves a cushion with the way they performed for three-and-a-half quarters Friday night at Doc Harris Stadium. That cushion was enough to get the defending state champions to the Class 2A football semifinals. 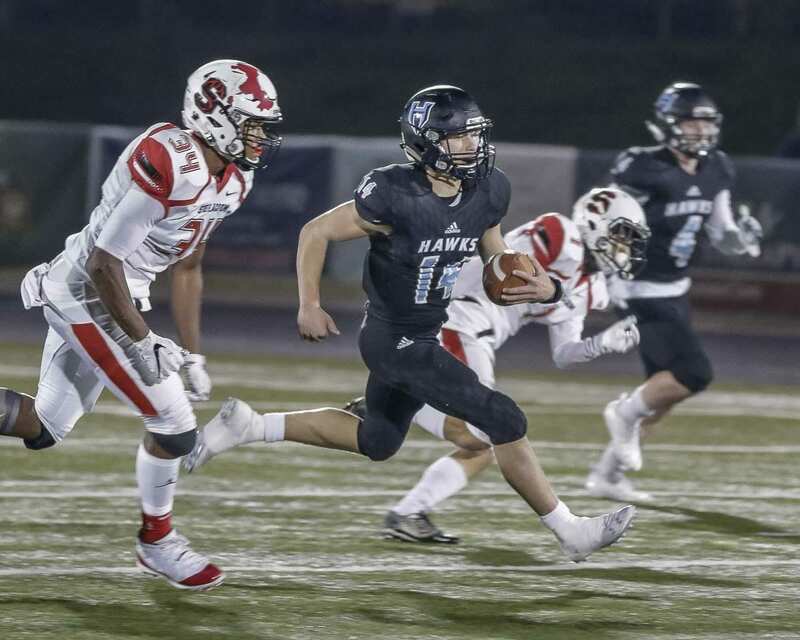 Levi Crum threw for 317 yards and three touchdowns, and the Hawks survived a thrilling comeback attempt to hold off Steilacoom 35-28 in the quarterfinals. Hockinson took a 35-7 lead with 7:39 to play in the game, but the Sentinels scored three touchdowns in less than four minutes to pull within a score. Hockinson’s Peyton Brammer, playing in pain for much of the second half, willed himself onto the field as part of the “hands team” and recovered Steilacoom’s final onside kick with 1:39 to play. The Hawks were able to go into Victory Formation three times to run out the clock. Hockinson (11-0) will host the winner of Saturday’s game between Ellensburg and Liberty at a stadium in Clark County next week. Those final minutes, when the Hawks went from cruising to holding on to their lead, should not take away from their accomplishment. These Hawks have reached the final four for the second consecutive season, a first for a Clark County Class 2A program. “To go back-to-back (to the final four) is huge for our program and what it stands for,” Racanelli added. Hockinson coach Rick Steele agreed. 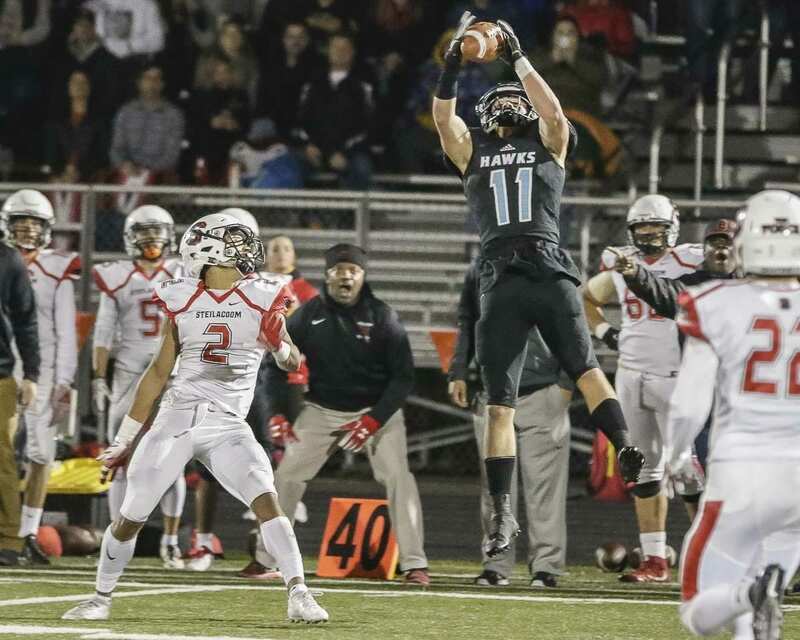 Hockinson had just one game that was remotely close this season, and that was a 15-point victory. The Hawks looked to be running away from the Sentinels for another lopsided victory, too. Brammer, who had 106 yards receiving, caught a 14-yard TD pass on the opening drive of the second half for a 14-point lead. Racanelli scored on a 1-yard TD run five minutes later to make it 28-7. The Hawks later would go 97 yards on 10 plays, with Racanelli scoring on a TD pass from Crum to make it 35-7. Everything was clicking for the Hawks. Emeka Egbuka, a sophomore who is ranked the No. 2 athlete in the nation for his recruiting class, caught two of the fourth-quarter touchdown passes for Steilacoom. He finished with 12 catches for 185 yards. Steilacoom quarterback JJ Lemming, who had 72 yards at the half, finished with 377 for the game. Steele noted that with so many blowouts this season, it can be a challenge for his players in the fourth quarter. It is a lesson, and fortunately for the Hawks, it was not a costly lesson. They still have football life after winning their 25th consecutive game. “The big thing for us, it’s four quarters long, and we’ve got to keep playing,” Steele said. Of course, on the flip side, the first three-and-a-half quarters matter, too. Racanelli scored on a 1-yard touchdown run late in the first quarter. Early in the second quarter, Nick Frichtl beat the Steilacoom defense to grab a 23-yard touchdown pass for a 14-0 lead. The Sentinels had one big rushing play all night, a 25-yard touchdown by Jaymason Willingham to cut the deficit in half. The third quarter belonged to Hockinson, pushing the lead back to 21. The advantage got up to 28 in the fourth quarter, too. The Hawks were on their way to the semifinals. That way got a little challenging, but they remain on the road, hoping Tacoma will be the final stop. RUSHING: Steilacoom — Willingham 8-43, JJ Leming 4-4, Team 1-(minus 4). Hockinson — Jon Domingos 2-9, Crum 15-55, Racanelli 10-46, Garrett Gundy 3-18, Cody Wheeler 4-16, Aidan Mallory 2-19, Team 5-(minus 18). PASSING: Steilacoom — Lemming 25-41-1-377. Hockinson — Crum 22-46-2-317. RECEIVING: Steilacoom — Jayden Coalsen 6-45, Egbuka 12-185, Alex Brady 2-36, Shird 5-111. Hockinson — Racanelli 6-94, Garrett Gundy 2-15, Peyton Brammer 6-106, Wheeler 3-16, Aidan Mallory 1-14, Frichtl 2-49, Jeremiah Faulstick 1-9, Domingos 1-14.